The UHBX-SW3-S from Hall Research, a multi-input switcher with HDBaseT output for extension up to 500 feet, provides two HDMI and one VGA inputs. The switcher can detect the active input and switch to it automatically, or the user can select any of the inputs for display using the buttons on the unit. HDMI inputs support resolutions to 4K (UHD), and one of them also supports MHL (Mobile High-Definition Link) with a phone-charging feature. The VGA input supports all YPbPr or RGB resolutions to WUXGA. 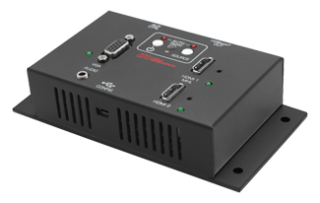 The VGA video and associated audio inputs are digitized, converted to HDMI, and scaled to 1080p for trouble-free display on any HDMI TV. 4K video can be extended to 330 feet, while 1080p signals can go as far as 500 feet. No power supply connection is required since the switcher gets its power using PoH (Power-over-HDBaseT) standard from the remote receiver. The UHBX-SW3-S can also function as a controller to turn the display on and off via stored IR or RS-232 commands either manually or automatically. The surface-mountable enclosure is compatible with Hall's UHBX-R-PSE receiver and can also be connected directly to projectors or displays with native HDBaseT input using a PoH injector. A USB port is provided for programming the switcher using Hall Research's free Windows GUI software. Additionally, the unit provides an IR detector that can extend IR signal to the remote receiver. The UHBX-SW3-S can also accommodate optional external keypads conveniently located for controlling power state, input selection, and volume control.